Click here for a Free & Accurate Evaluation of your Condo! Halifax Landing brings together the beauty of our area, a comforting convenience, and a luxury in living that not many pieces of real estate can't achieve. 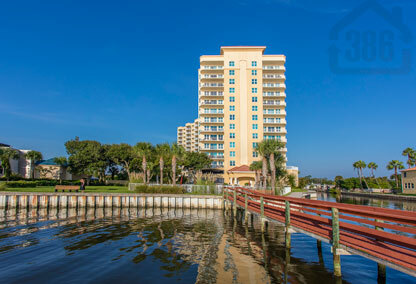 Most homes here provide panoramic views of the Halifax River and the crashing waves of the Atlantic Ocean beyond. Bask in the breeze from your balcony and take comfort in knowing you have the convenience of local schools, stores and restaurants nearby. Halifax Landing offers a peaceful and private lifestyle that is set away from some of the hustle and bustle of Daytona Beach. At Halifax Landing, there are three different floor plans to choose from. There are both two and three bedroom options ranging from over 1600 sq. ft. to nearly 2500 sq. ft. that are sure to fit you or your family’s needs. Inside you’ll find the finest in custom cabinetry, new, energy-efficient appliances, granite countertops, ceramic tile floors, and of course the large balconies that offer expansive views of the coastline beyond. Everything you need to make this a home is here, except you and your family. Not convinced? There’s still much more to living in the Landing than just your condo. Included with the purchase of your new home at Halifax Landing are the expansive common areas which are anything but common. Enjoy the heated outdoor pool with a spa and cabana or take a walk down the boardwalk to the river and relax with a day of fishing or boating from one of the Landing’s two boat slips. Inside there’s a game and billiards room as well as a fully-equipped fitness room offering equipment for almost any fitness need as well as a dry sauna. If you wish to entertain a large group and show off your new home, a community social room is available as well. There is so much to see and experience at Halifax Landing that you really should come explore yourself. But hurry, these enchanting homes at enticing prices won’t be around for long. Call Kevin now at 386-527-8577 and set up your first visit to your new home.